As I closed in on the few remaining Colorado Fourteeners, my wife and I decided to visit Durango for a vacation during which I would grab the only remaining cluster of Fourteeners, including Windom (14,082), Sunlight (14,059), N. Eolus (14,039) and S. Eolus (14,083). 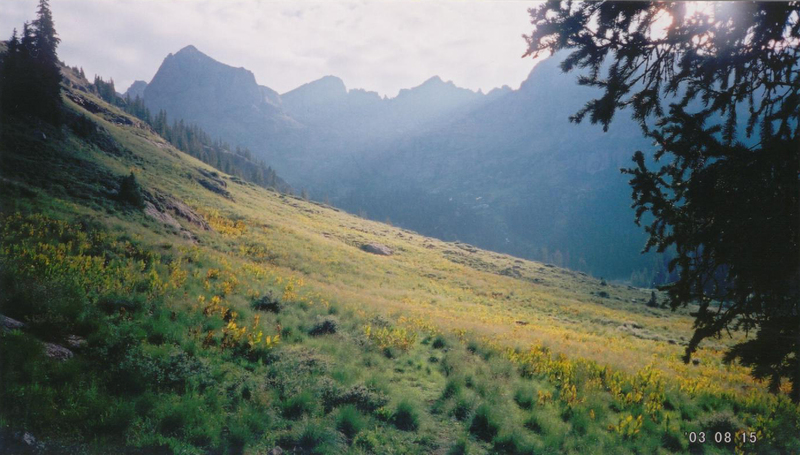 On August 12, 2003 Susan, Isabella and I made the extraordinarily long drive to Durango. We arrived late afternoon on Tuesday with enough time to scout out the train situation and a decent dinner at Francisco’s. An early night facilitated by sharing a single room with a 1 year-old served my purposes well. The Double Tree hotel was only 1 block from the train station, so I had time for quick, but good breakfast and a short walk to the train station after a 6:30am wakeup call. I boarded the train (open gondola #6, seat 11) at 7:30am as instructed and awaited the scheduled departure at 8:15am. The train actually left at 8:15am and I sat puzzled over my uneaten bacon as I watched the last few people crawl onboard at 8:10am; I decided for the hundredth time to never again follow the instructions of the “system” too carefully. With a whistle blast and a cloud of coal soot, we rolled out of town. It was a surreal way to begin a climbing effort. As I waved to the crowds of people who are compelled to wave at departing trains, I was thinking that I had added a new mode of climbing transportation to my experience sheet. I used donkeys and a boat in Bolivia, a bus in Ecuador, chairlifts in Switzerland, a funicular in France, and now a coal-burning, steam-powered train in Durango (and, yes, I did get cinders in my eyes). The train ride was enjoyable, but a bit long. We arrived at the Needleton TH at 10:47am (right on time) and I began hiking at 11am. The trail to the Chicago Basin was excellent and used the distance efficiently to eat up the altitude. I reached the relatively flat Chicago Basin before 2pm and selected a secluded spot for my tent at about 11,000′ right at 2pm. The guidebook indicated I could have gone further (to approx. 11,200), but I was feeling tired and wanted to dump the heavy pack to give myself a chance to bag the Eolus’ (Eoli?) North and South later if the weather held. I took a bit of extra time to set up camp with a bit of forethought regarding rainfall pooling and runoff; I was told by descending climbers that rain was the regular feature of the preceding week, and lots of it. I set the tent on the crest of the slight hill in the camp area and used rocks to keep the tent footprint from being swamped by water (no water between footprint and tent floor!). I also built an excellent vestibule rock floor and a drainage gully to augment the natural runoff flow that would divert any rogue rivers trying to find a path under my tent. Then I hung my food and set off for Twin Lakes. Hiking up the nice trail toward the extraordinary basin beneath Peak 18, I unexpectedly found a fork in the trail around 11,100 (after an open meadow) marked by two cairns; I guessed and luckily took the upper (left) fork which led to the steep ascent up the creeks and falls to Twin Lakes. During the ascent, the weather continued to worsen (i.e., thickening, darkening clouds to the south and east); but blue skies to the north and west, as well as overhead kept me in the game. I figured that if the weather held, I’d bag a couple peaks before dark and then finish on Thursday, and if not, my knowledge of the start would help in my predawn route finding of the Twin Lakes. Of course I also had the option of rising very early Friday morning to do any remaining peaks before my early afternoon train ride. But that was my last resort, so I kept it out of my plans. I reached Twin Lakes around 5pm, just when the blue-sky patches finally disappeared; I decided I would forgo the summit attempt and just gather beta on the climbs for Thursday. After about 10 minutes, the thunder began. It was some miles distant, but I didn’t want to be so high when it got closer. I made excellent time back down to camp, and got drenched by a moderate rain. The rain abated for 45 minutes as I gathered water for the evening and sorted out my sleeping arrangements, but then it restarted in earnest. I fell asleep quickly and was gone from this world until artillery began falling about me. It was a war zone, as best I can tell. 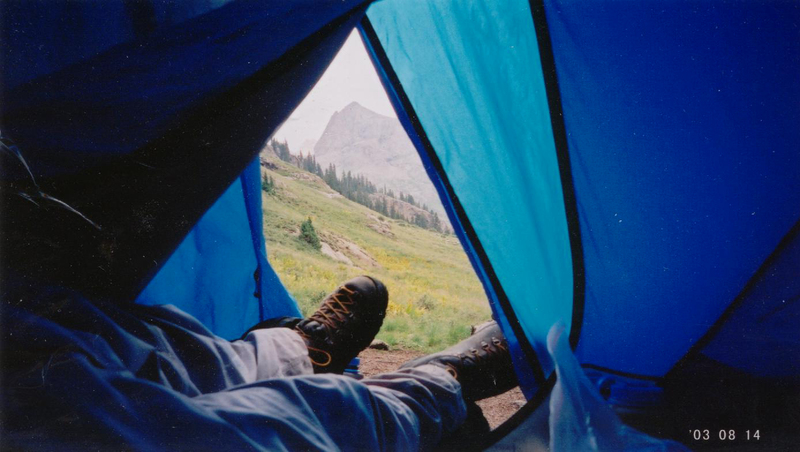 I began thinking about the chance of rock fall from lightning strikes in the peaks above me and wondering if I should move my tent…but then my alarm went off at 3:55am. At 4:30am, I was moving up the trail once again. Everything was wet, but the sky was clear. In fact, it was a brilliant full moon and everything was lit up magnificently…. I was thinking that I could probably find my way without a flashlight. About 5:00am, my flashlight died and the spare died immediately thereafter, and I found that I could hike by moonlight alone. My late afternoon reconnoiter proved invaluable during this moonwalk…except for a few steps in water (invisible in the shadows), I had no mishaps. 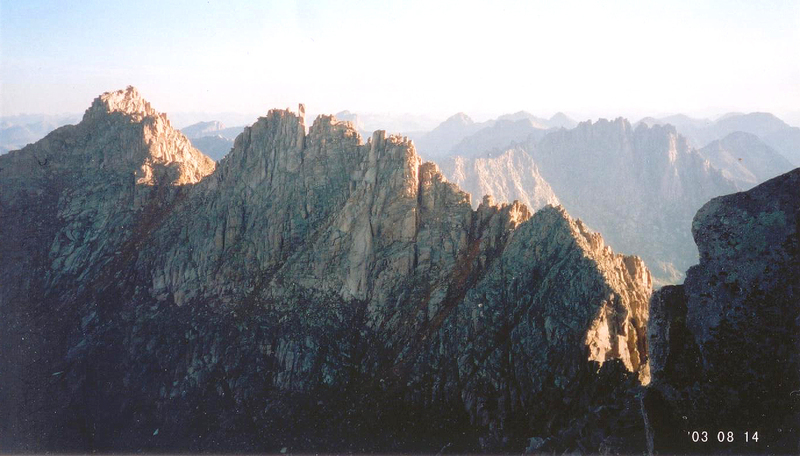 The morning light became useful about 6am, which was about the time I was mounting the saddle between Windom and Peak 18; I scrambled up the good talus to be greeted by a cold morning wind. My spare socks served me well as mittens and I continued up the ridge. The heavy rain had made the lichen especially slippery, resulting in a few unfortunate episodes with me sliding over rocks with sock-covered fingers grasping for purchase…nothing serious, fortunately. I reach the summit at 7:30am after sorting out the summit block puzzle, and just in time for the sun rise. It was a glorious sight. I received my first rays of sun for the day and greedily soaked up the radiation it provided. Looking north, the Sunlight summit did not look as advertised, which I chalked up to another over-rated climb; and Eolus looked very far away. I didn’t stay but a few minutes and then headed back down the ridge to a midway point that looked good for traversing into the gully between Windom and Sunlight Spire. From the gully, I headed up the Red Couloir. It was loose and worn, but it served my purposes well. I reached the saddle between Peak and Spire and followed a cairned route beneath the ridge (Twin Lake side) toward the Sunlight summit. I reached a spot with a hole in the ridge that looked like the “window”, but wasn’t. I took it and found some of the hardest climbing of the day…as I neared the summit, I still thought the summit block didn’t look hard and figured my off-route climbing was the crux. I reached the summit marker at 9am, and dropped my pack before walking over to study the summit block. I worked my way up the sloping block via the crack and found the standard way up which I took up to the block before the block before the block (you’ll understand when you see it). I could see the moves up would be easy, but could also see that the down climb would be dynamic. Me no like. I spent the next 15 minutes looking for an alternative route only to find that, like thousands before me, “The Step” was the only way. I decided I could not go home without standing on the block. I steeled myself to the task, climbed up to the secondary block via a knob and then stepped up to the summit block. I immediately turned around and stepped down and squatted to ponder the next move; after a moment’s consideration, I did a sideways jump step as practiced so many nights watching Rocky Horror Picture Show as a kid (i.e., “a jump to your left”). I packed up and left the summit around 9:30am. 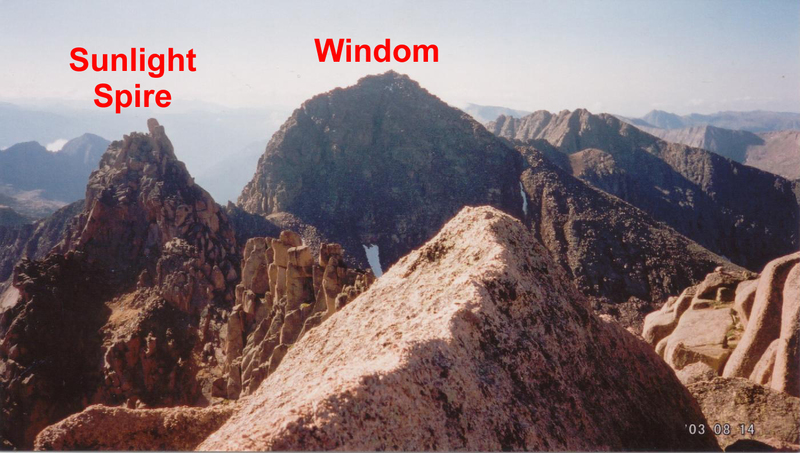 I did not like the down climbing reversal of my approach and looked around for an alternative; I found the real “window”. It was an easy descent; I used the East slopes route (marginal) to gain a better angle toward Twin Lakes, which I reached at 10:30am. I was making good use of my time, but the weather was not cooperating. I should have had plenty of time to summit before afternoon weather, but the clouds were forming up already and I doubted I had much time left. I allowed myself enough time to refill my water bottles and then I headed up the well-marked trail to Eolous. I was feeling quite tired and could not do it in a single push; I kept pushing myself to stretch-out the runs between rests so I could beat the weather. I followed a set of cairns to the saddle between North and South Eolus. The trail ascended directly up toward the summit of Eolus and underneath the “Catwalk” ridge. Just below the Catwalk face, a gully-like feature to the right allowed an ascent to the basin beneath North Eolus and the Saddle between North and South Eolus. The ascent up the 50-foot cliff to reach the saddle was a surprising 4th class effort, but I probably didn’t find the easiest way. Once on the Catwalk, I jogged toward Eolus, finding it to be an admirable feature but of limited risk. Looking at the weather, I could see that the clouds were worsening somewhat, but I felt I had enough time to do North and South Eolus…. getting down would be considered later. 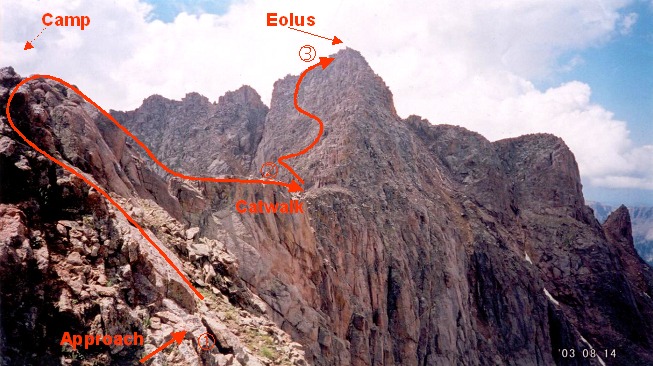 When I reached the east face of Eolus, I was surprised at the steepness of the face. Multiple routes were marked by cairns, and a fairly easy path to the summit was found. I spent a few minutes on the summit with a couple of fellows from California and then left so as to not show too much disrespect to the weather gods. I found an even easier descent route and was running back across the Catwalk after only a few minutes. The ascent of North Eolus was a pleasure. I’d call it a 3rd class scramble up crumbly granite. The summit had a marker but no register. I didn’t stay long, again out of respect, and reached the saddle 15 minutes after leaving it for the second time. Once again, I found the down climb from the saddle via a large crack to be a solid 4th class effort. This time I took care to use the best holds and still felt that only the final pitch on Crestone Needle (via the traverse from Crestone Peak) surpassed it (and even then only due to length). A family of goats was my only audience as I quickly hustled down the trail to Twin Lakes. I was probably off route, but I didn’t see a better way. About 2pm I passed an older couple ascending toward Eolus; they were 1 hour from the summit at my pace. They said they were going to see how far they could get before the weather came. I offered a “good luck” and then continued downward. The next group I met was going to stay in the Twin Lakes area to celebrate their summits. I was going to get the hell out of harm’s way and get below tree line. This I did. Once near camp, I decided I would use the free time I had to soak my used feet in cold water. I cannot recommend anything better to rejuvenate the body and the spirit. I refilled my water bottles (up-stream from my feet), put on my spare socks (it wouldn’t do to put the wet, nasty socks back on my clean, fresh feet), and headed to camp about 100 yards away. I was trying to decide what to do until dark when the rain started. No thunder, but a steady rain. I decided I would take a nap. Around 7pm, I woke up to a pleasant evening, and finished dinner. I tried to read a bit more of Asimov’s Foundation and Empire, but I drifted off to sleep even as I wondered about the people frolicking above tree line. I tried to go back to sleep enough times to wait for my 9am alarm, but I couldn’t do it. I just couldn’t sleep longer than 13 hours. I didn’t have anything warm except my sleeping bag, so I laid in it whilst I pondered my amazingly empty day ahead of me: pack up (1 hour), hike to trailhead (2 hours), wait for train (3 hours), ride train (3 hours), and finally be able to enjoy an evening with my family. Eventually I stirred and began step one. With approximately 13 hours of sleep, I felt completely fresh. The hike down was uneventful while the wait for the train was interminable. Waiting for the train, I passed the time by throwing rocks into the river until my arm hurt. Then I threw lefty. It didn’t work; three hours with nothing to do still felt like three hours with nothing to do. I did chat with the California fellows (from Eolus summit) for a short while. They told me they met a very wet, older couple coming down from Twin Lakes after reaching the summit of Eolus, their 54th Fourteener. 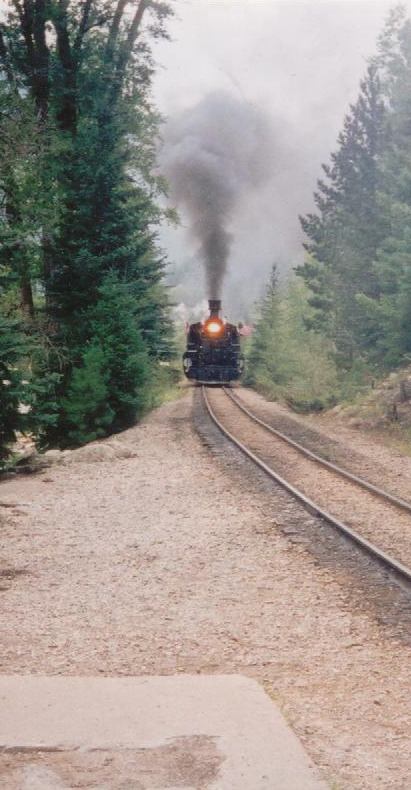 Once on the train and moving without effort toward Durango, I felt privileged to be able to ride such a train. I even bought a cold Coors Light to celebrate my adventure. Even still, 3 hours is a long time to look out a window. I was delighted to return to my family and enjoy their company in Durango one final evening. Each of the three main peaks had admirable attributes, such that it would be hard to say any one was better than the others. 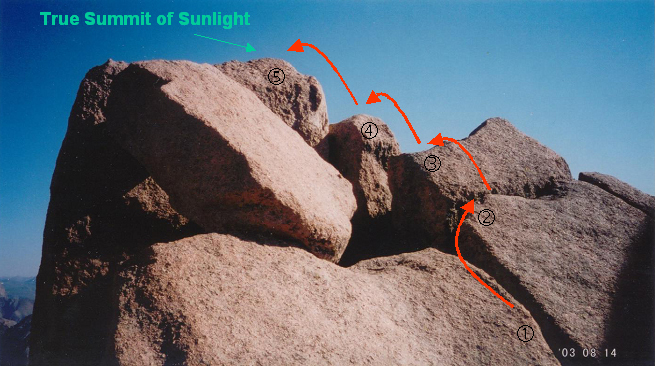 I’d have to rank the final summit move on Sunlight as the single scariest move I ever made on a 14er. 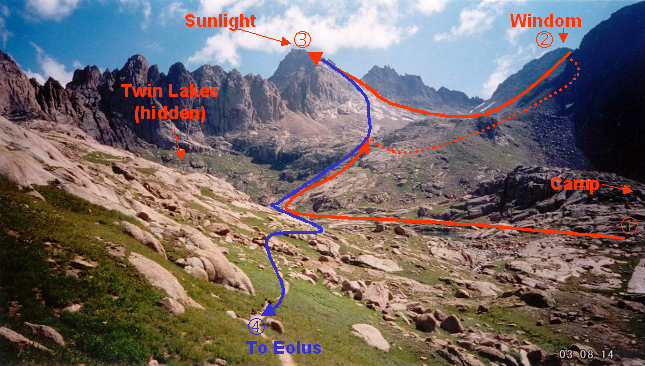 This entry was posted on March 7, 2009 at 8:37 pm and is filed under 14ers, mountaineering, Trip Reports. You can follow any responses to this entry through the RSS 2.0 feed. You can leave a response, or trackback from your own site.